The Hydro Launch is an awesome summertime toy. I wish I had something like this as a kid. In fact, it makes me feel like a kid again. I think I want to play with this one just as much as the kids. This thing comes with a launch pad, the yellow base there, which has a hose running from it to the red throttle type controller. The garden hose get's plugged into the throttle. The throttle controls the pressure of the water stream coming out of the launch pad. If you slowly increase the pressure it will rise gently and hover on top of the stream of water. From there you can decrease the pressure and it will drop. It will balance on the stream of water for quite sometime and you can move it up and down very easily. 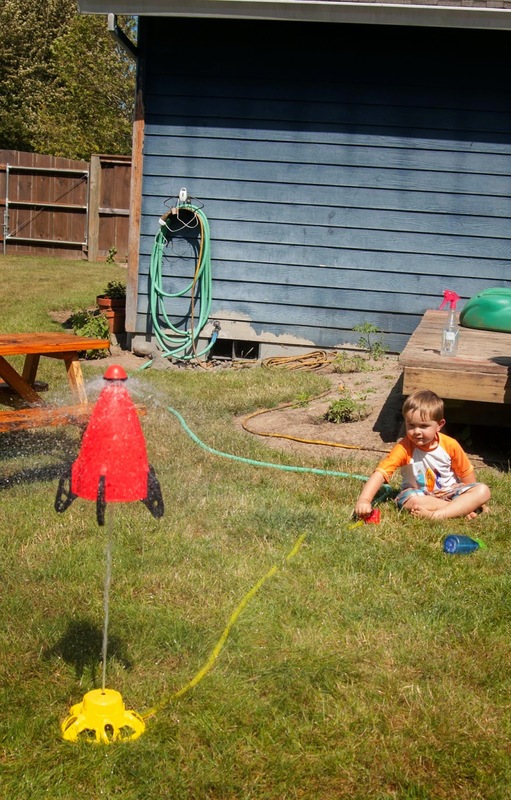 When it is hovering in the air it sprays water all around it and actually works as a pretty good sprinkler. Lots of fun for the kids to run through as well. Or you can push the throttle up quickly and launch the thing sky high. As you can see this thing can fly. It looks like it is higher than the peak of our roof in this picture but that is just perspective. But I can tell you, it is very high. The stream of water with out the rocket on it, is almost as high as our 7 year old birch tree. 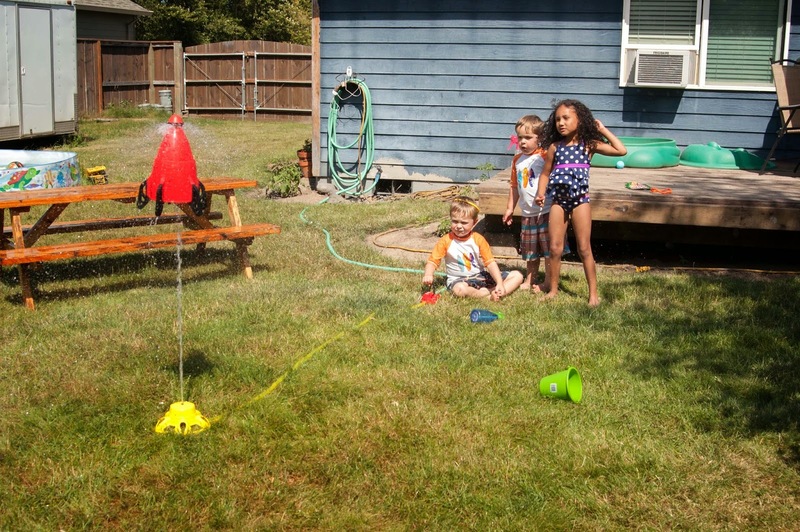 It is best to play with this toy on a level surface, although, on a slight angle the rocket still corrects itself, it just won't balance as high on the stream of water. The rocket itself is completely hollow. It's just a light weight and flexible plastic, but it's pretty sturdy. 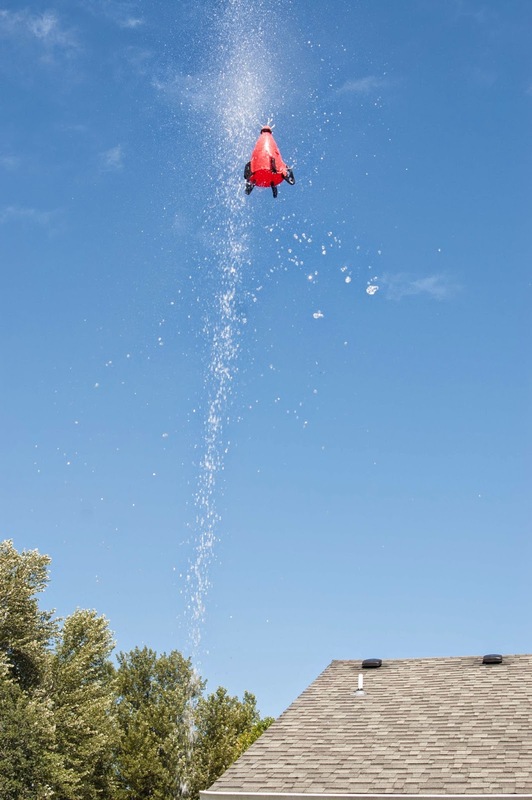 The tip of the rocket is a foam cone. It takes a lot of the impact when it falls to the ground. The foam tip on ours has a split in it. I am not sure if this is just from wear and tear or if a little one stuck their finger in it. Even though it has a split, it's holding it's shape and not coming apart. The rocket is super easy to place on the launch pad. There is no exact science. It just sits on top, nothing has to be perfectly lined up for it to work. If it's sat on top of the launch pad crooked, it corrects itself. This is nice, because kids of all ages can fully play with this toy. On the inside where the water meets the rocket there is a ridged surface. I think that's what makes the rocket spin when it's hovering. There is definitely a lot of engineering that went into this toy to make it work so well. Some things to be aware of. The pressure of the water coming out of that launch pad is pretty intense. If a child was leaning over it while another child turned it on, I would think it could be pretty painful to the eyes. The other danger is the rocket falling on a child as it comes down. This has happened a couple of times to new users. There was no significant injury, just a bit scared, and they quickly moved on. Once everyone knows how this thing works and has had some time with it, it hasn't been a problem. It falls with in a pretty small radius, and it's easy enough to be out of it's way. The wind does play a factor in where it falls. Once you know the direction the rocket lands, you can make sure the throttle is not in that direction, and then everyone can be safe. I have been moving the location of the Hydro Launch around a bit because it does do a good job of watering. 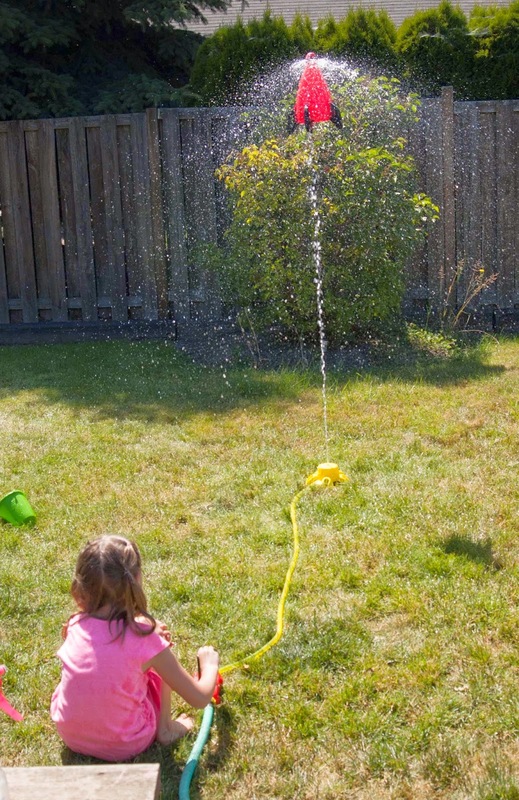 We don't have a sprinkler system, so the Hydro Launch might just help keep our grass green this year. I would recommend playing with it on grass. If you set it up on pavement or gravel, the rocket would get a lot more beat up upon landing. The only major problem you are going to run into is how to take turns because everyone is going to want to play. I have been letting each child go twice in a row before their turn is over. I might even bump that up to three next time we get it out. If they only get to do it once, then by he next time they get a turn, they have forgotten the feel of the throttle and the effects their movement has on the rocket. 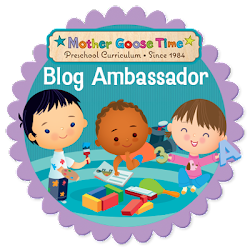 When they get to go a few times in a row, they can really enjoy experimenting with it, while at the same time learning all about the laws of physics.